The “Ice Bucket Challenge”, the viral awareness campaign to raise money for ALS, has swept the world in the past month or so, raising over $100 million for a cause that was previously under-profiled, and flooding social media, so to speak, with videos of people from all walks of life pouring ice-cold water over themselves. More than 3 million people have taken part in the Challenge to date and the amount raised is more than 35 times what the ALS Association raised during the same time period last year. In any sector that’s an extraordinary feat. It’s incredibly simple – and I mean that in the best sense of that term. No-one has to learn anything, buy anything, go anywhere, enrol for anything. The raw ingredients to keep this Challenge going – bucket, ice, water and phone – are ubiquitous. The instructions are obvious. That makes participation very accessible. It’s high impact and immediate – the Challenge is over in seconds. That in itself points to an interesting phenomenon: magnification. The ability to undertake a small, short act for a big cause – with the juxtaposition of participation and perceived impact actually crucial to the campaign’s success. It’s shareable – yes, to some extent that makes it a vanity project. But, more importantly, it’s not only something that people can do visibly and in a social context, it also provides highly visual, personalised content that people can pass on to others. Causes become much more real for people when they can identify in some way with what they are being asked to support, even if that identification is just a selfie. There’s a strong clear call to action – the power of this campaign doesn’t lie so much in the act of pouring the water. It stems from what immediately follows – the nomination (call out) of three people by name on social media to do the same thing. The pitch is also image-perfect: crazy enough to feel daring, but not so weird that people feel overly self conscious. It’s a great cause – by taking part, people believe they are making a difference. So, there’s a strong feel-good, do-good factor operating here. As the Telegraph pointed out, it’s much less compelling to anonymously donate to something “icky” like guinea-worm disease that takes place elsewhere in the world, because the disease itself is not something that gets talked about and the social support to participate is lacking. It’s democratic – everyone can take part. They can give as much or as little as they can afford. Participation links people socially. Suddenly there’s a connection between the person who did this in their back yard and Bill Gates, Martha Stewart, Donald Trump, the New York Yankees et al. What the Ice Bucket Challenge has done so well is to find a fun way to form an unexpected community. It’s seasonal – no surprises that this took place in the middle of the Northern Hemisphere summer. It’s unexpected – causes with gravitas tend towards approaches that are more serious. The success of the Ice Bucket Challenge proves the power of disruption. It’s not something people instantly associate with a terrible disease like Lou Gerrig’s, and that gave it an informality that people were drawn to and wanted to share. It’s franchiseable – other brands could take part, even brand their participation, and that just added to the sense of involvement. When KFC got involved, they dressed up an actor as the Colonel and did the Challenge with a KFC bucket. CSR meets brand awareness. Everyone wins. 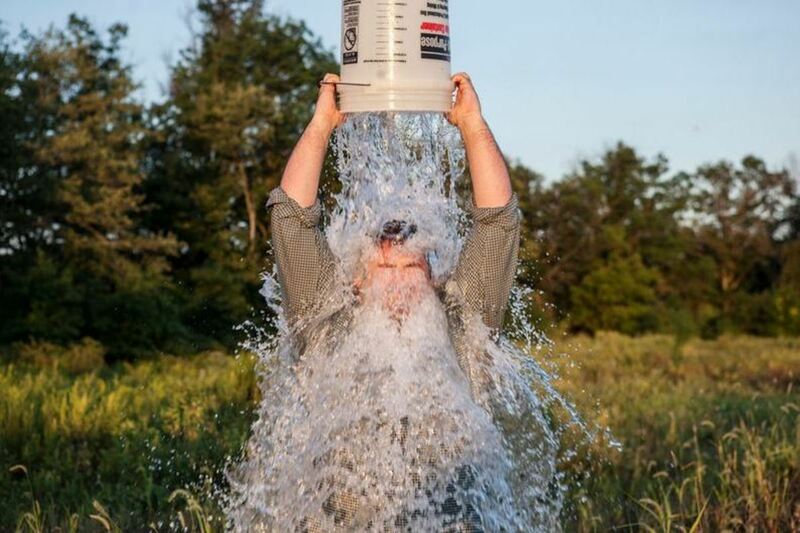 The power of pop culture – love it or loathe it, the clear take-out from the success of the Ice Bucket Challenge for me is that pretty much every brand campaign that wants to go social must be mobile camera-ready. Simple principle: if they can’t shoot it, they won’t share it. It needs to be personal – any event or campaign you plan needs to be one that people want to be seen to be part of. Increasingly, people don’t show up at an event, they show up with an event. What social signals does your event or campaign send about the people who support it? The hard one – your idea must be both simple to do and yet not have been done before. In the case of NGO brands specifically – although I suspect this is also true for consumer brands as well – it must change the world (or rather, their world) for the better in some way and yet not take the world to make that happen. As Rick Smith put it so well in Forbes: it must be big, selfless and simple enough to generate a multiplier effect. An idea he neatly refers to as a “global cascade”. As for The Ice Bucket Challenge – will it keep working? This is probably not an idea that a whole lot of brands can now successfully adopt and it is not an idea that in itself has a long half-life. Like all things viral, the dynamics of this campaign are probably fast uptake followed by relatively quick fall-off as people’s attention shifts to the next ‘thing’. It has worked wonders, and it really has been a fantastic and inspiring achievement, but I doubt it will continue to rake in participation and money at the rate that it has. I think this is an idea that has been banked. I really hope I’m wrong. The challenges now for ALSA will be to convert big into long – to persuade enough people to take a deeper and longer term interest in supporting the fight against ALS than just the Challenge itself. In an article in The Guardian, Rachel Collinson offers the ALS Association three pieces of advice on how to do that: educate new donors about the difference their money will make; start a thank you campaign that aims to be just as viral as the original; follow that up quickly with a series of welcome messages explaining more about ALS and countering some of the rumours that have circulated about their spending. Other take-outs from the same article are not dissimilar to those facing any brand with a viral message. Have a scale-up model that enables you to meet demand as it builds, recognising that if your campaign trends the levels of interest can be huge and sudden and the criticism voracious. Understand too that you will lose control of the campaign once it passes a certain level of popularity. Plan for that by having a way to ‘hand over’. Does this campaign game-change philanthropy? No. In the sense that, as above, it doesn’t change the scene for all. But it should inspire NGOs in particular to think more radically and simply about how they foster awareness. What it also does is underscore the need for NGOs to think about causes at an individual level of appeal rather than even as an appeal to individuals. In the same vein, it’s a reminder to consumer brands of the ongoing shift in engagement from widespread communication to direct involvement. The new take on ‘call to action’ isn’t what you are asking consumers to do, it’s what you inspire them to do as they act. The key question for every marketing manager planning a campaign right now: What will our buyers share and how will that lift our market share? In my opinion, that’s the real conversion equation today right there. Next PostFrom CMO to CEO: the next era of brand leadership?